Bugs, Bed — In the past week, the itchy nuisances have made their presence known in the entertainment industry, first shutting down Time Warner’s New York office after an outbreak couldn’t be readily contained and now infesting the AMC cineplex in Times Square, forcing the entire theater’s doors to close. The bad news, however: your significant other will still refuse to believe the excuse that you contracted crabs during a showing of The A-Team. 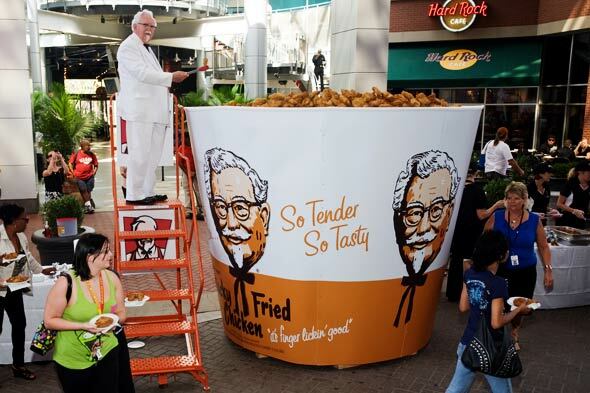 Chicken, Kentucky Fried — During a 70th anniversary celebration in its hometown of Louisville, Kentucky, fast-food chain KFC broke the Guiness Record for “the world’s largest serving of fried chicken” by serving up 2,000 pounds of the entree in a bucket eight feet tall and nine feet wide. After validators confirmed the record had been set, Kirstie Alley was permitted to continue enjoying her lunch. McAfee — The popular manufacturer of software to keep your computer safe and running has released its yearly list of the top ten celebrities most often used to lure surfers to sites which may give one a computer virus — with Cameron Diaz, Julia Roberts and Jessica Biel topping the countdown. In a related note, the Los Angeles Health Department has similarly released a list — featuring Lindsay Lohan, Mickey Rourke and Paris Hilton — of celebrities who may give you an actual virus. Handler, Chelsea — The E! network’s late night comic has been tapped to host this year’s MTV Video Music Awards, a prestigious honor shared with past hosts Chris Rock, Diddy and Jack Black, among others. At first this seems like an odd choice, but when you think about it, it makes a lot of sense: like many teenagers today, Handler reeks of booze, sleeps around and isn’t particularly interesting to listen to. Miller, Steve — The University of Southern California has announced that classic rock guitarist and frontman Steve Miller will serve as the Thornton School of Music’s artist in residence for the upcoming term. Some students will just call him Professor Maurice. Seagal, Steven — Steven Segal lashes out at critics of his music, stating “I’ve played with the greatest blues masters and legends of our time…they love, respect and praise me” in a recent interview with Hustler Magazine. Segal then, in other interviews, spoke on the subtle character nuances of Great Expectations’ Pip and Estella in Recreational Boating Monthly and shared his recipe for smoked gouda fondue in American Baby, completing a full day of completely misjudging his audience. Showblockers — For your Friday entertainment, I submit this recent article from The AV Club which details 22 of televisions greatest “showblockers” — characters who only hurt the television shows they appeared on. It’s good fodder for discussion. Dwight Shrute? Rudy Huxtable? Discuss. And have a great weekend.